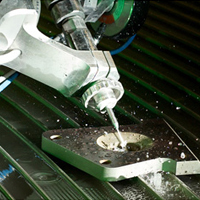 DallasWaterjet serves many applications for the industrial manufacturing, energy industry, construction and architectural metals, technology and retail markets. Retail – Signage, display fixtures, and more. Floor Logos – Custom floor logos from VCT, quartz, stone, or metal.